Well many of you have probably been wondering why N.E.R.D. has been a bit slow for the past couple of months. Well, August was a bit of a nightmare month (although an enjoyable nightmare for the most part). I got a chance to go to Siggraph’07 in San Diego, followed by a European trip to end the other project I’ve been working on (Comedia II) at Ryerson. That trip passed through Amsterdam (WOOHOO) and ended in Stuttgart with a succesful demonstation of our high-resolution low bandwidth screen sharing app which was a part of Comedia II deliverables. The screen sharing basically uses a Blackmagic Design Intensity card to share/deliver/encode the DVI output of a CAD/CAM workstation to a remote site and with the addition of our home-brew pointer control system, to allow multiple remote audiences to have collaborative engineering design review sessions. September was pretty much spent planning and implementing our demo for the GLIF conference in Prague. This was a demonstration put together by some of the CineGrid consortium members. 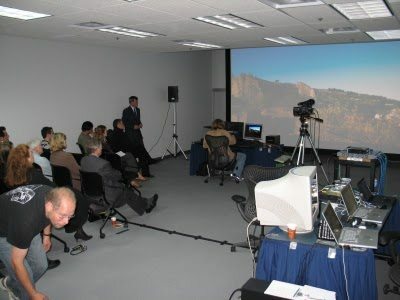 The demo involved connecting three sites (Ryerson University‘s Dcinema Lab, Calit2 at UCSD and Barrandov studios in prague) via 10GigE optical connections in a layer-2 network. Below you’ll find the overall net diagram prepared by Alan Verlo. 1) DCinema footage was shot in Prague last weekend (Sept. 15-16) using a DALSA Origin 4K DCinema Camera. 2) The 4K raw imagery from the camera was “shipped” to Calit2 overnight via the network where it was “developed” into a series of RGB files on their Compute Cluster and shipped back to Prague via network. 3) The finished frames where loaded into a Baselight 4 system. This system was literally chopped in half with the backend/storage in Prague and the front-end control panel at Ryerson University in Toronto. 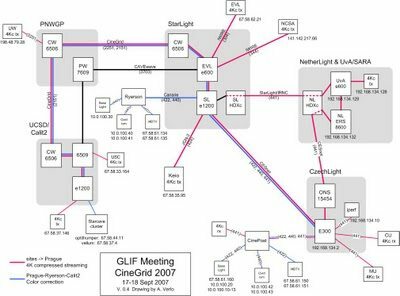 4) The front-end and the back-end were linked via 1x1GigE links at both sites (Toronto and Prague) over a vlan440 (see diagram above). 5) The output of the back-end system in prague was split. One link for Prague team (ie: Director of Photography) connected to their Sony SRX-R110 and One link for Toronto (ie: Colourist). 5) Since the Toronto team needed to see the output of the material they were manipulating, we used the iHDTV system developed at University of Washington/Research Channel at both ends to transport the HD-SDI 2K 4:2:2 imagery back to Toronto over 2x1GigE links. This signal was fed into the Sony SRX-R110 projector residing in the DCinema Lab at Ryerson. 6) The iHDTV systems at both ends (sender in Prague and receiver in Toronto) were isolated on vlan442 (see diagram above) since interpacket timing was found to be crucial for proper operation of our QVidium conferencing system and an isolated vlan for iHDTV turned out to be the solution. 7) In Addition to the above the Colourist and DP needed to have low latency video conference link in order to achieve an acceptable level of realtime collaboration. To that end, we also deployed two QvidiumHD 1394 IP Gateways with two Panasonic HVX-200 HD Camcorders to encode video/audio at both ends. 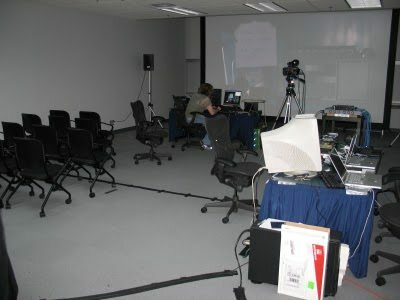 Additionally two PC’s with QVidium decoding software w/ DVCProHD codecs were installed at each end to setup a complete two-way low latency HD conference. The HD conference system ran at ~2x120Mbps on vlan440. 8) The main connections between all three sites was running at 10GigE over a layer-2 network and was split into individual 1GigE connections for the various parts of the project. On Tuesday morning we started the two way HD conference, connected the front-end of the Baselight system to the back and after some adjustments had the system up and running with 2K proxy output in Toronto and Prague. The Demo was a “First in the World” and will be (atleast I think so) the first of many more to come out of our lab and it’s collaboration with CineGrid partners around the world….So stay tuned. I’ve included a bunch of pictures I took during the build and the actuall demo, official CineGrid press release is coming soon and I will try to post the video that we shot at our end of the first session soon (it’s in DVCProHD and I need to book one of our suites to edit it together).